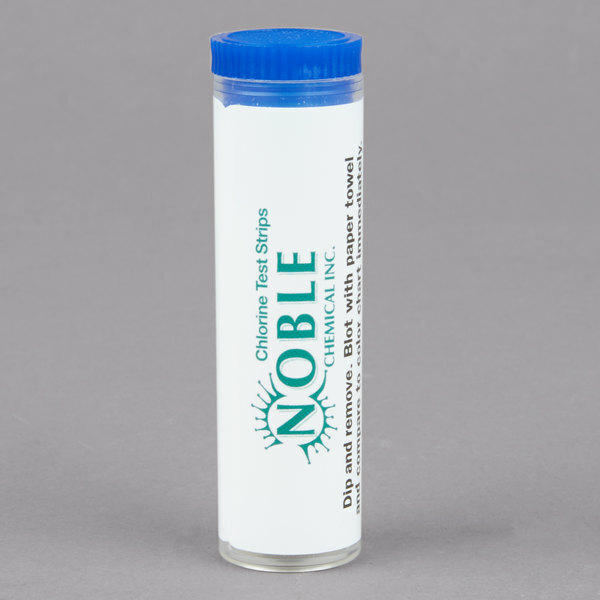 Noble Chemical CM-240 chlorine test strips are the simple, reliable, and economical way to measure the concentration of free available chlorine in sanitizing solutions. Each strip measures concentrations between 10-200ppm (parts per million), with color matches at 10, 50, 100 and 200ppm. The distinct color match at each full unit makes it easy for the user to identify the correct chlorine level. Simply remove a strip from the vial, dip the strip into the sanitizing solution, blot with paper towel, then instantly compare the resulting color with the matching chlorine color chart. The distinct color chart and accurate, reproducible readings give an immediate response for quick and easy use. Federal, state, and local health regulations require users of chlorine-based sanitizer solutions to have appropriate test kits available to verify the strength of sanitizer solutions. Sanitizer solutions are essential in the food service industry to ensure that sanitizers are at the proper concentration specified by the individual manufacturer. These test strips should not be stored in an area with high humidity or in an area where they may be exposed to water before use.